If you want to live in a country and understand its people, you need to have an understanding of the stories that they grew up with. Whether these are folk tales, fairy tales, or movies, they leave an impact on the psyche of the individual person. They serve as a reminder of the traditions, as well as the moral values that the majority of the population holds dear. Russia, and the surrounding countries of eastern Europe like the Ukraine or Belarus have a rich history of different folk traditions, among which the telling of folk tales and heroic epics is preeminent. Many of these traditions are shared between the three countries, while others exist only in some particular regions. These stories have been recounted from one generation to another. Many a grandson spent his nights sitting on his grandfather’s knee, listening to these wonderful tales, sparking his imagination with messages of courage and valor. Russian folklore is based on old pagan Slavic mythology, mixed with newer Christian beliefs and historical events. Together with stories about princes, giants, and Baba Yagas (witches), you catch glimpses of mythical cities, powerful enemies, and old wise men with magic powers. These stories not only reflect the beliefs and history of the various peoples who tell them, but also serve as a way to impart moral lessons to the succeeding generations. One of the most well-known characters of the old heroic tales is Ilya Muromets. Ilya was a big guy, who however suffered from various illnesses as a kid, which left him unable to walk. So until the age of 33, he spent most of his life sleeping on an oven. Then one day, he is miraculously cured by two old wise men. From that day forward, he turns into a powerful warrior and goes on to perform many outstanding deeds, including saving the city of Kiev from invaders. His story takes place in the era of the Kievan Rus, but mixes in various different time periods. Some parts of the tale recount historical events that happened in the 9th century, while others deal with events that happened in the 12th century. So just like a medieval James Bond, Ilya Muromets always stays the same age through various eras, battling enemies and slaying dragons. His story can also serve as an inspiration for young men growing up, since Ilya transformed himself from being an incapacitated cripple to a bogatyr, a fighter and the savior of a nation. His courage, strength and willpower were meant to be an example to help instill these qualities in the younger generation. During Soviet times, many of these epic tales and folk stories were made into movies. In 1956, the story of Ilya Muromets was made into a feature movie, directed by Alexander Ptushko, and starring Boris Andreyev, Shukur Burkhanov, Andrey Abrikosov and Sergei Martinson. Another interesting Soviet film is “Kashchey the Deathless”, produced in 1944, directed by Alexander Rowe (the script was co-written by him and Vladimir Schweitzer) and starring Sergei Stolyarov, Alexander Shirshov and Georgy Millyar (whose original last name was de Milieu, since he was of French origin, but he changed it after the Russian Revolution). It was a black and white film that came out at the time of the victory of the Soviet armies against Nazi Germany. It had a symbolic meaning: after much suffering and heroism the invaders are driven out and the country is left free once again. 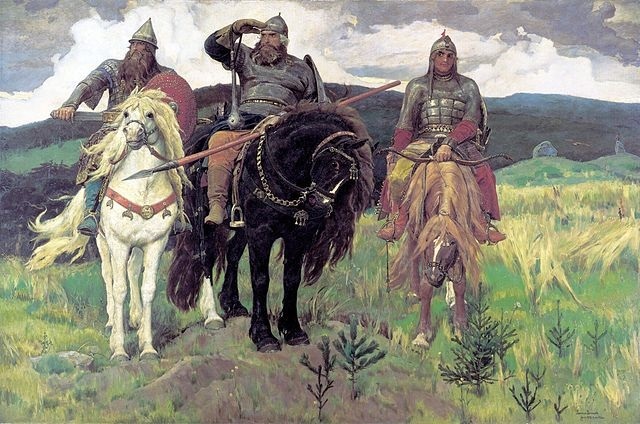 These different epic tales serve as metaphors for various repeating themes in Russian history. Many of these stories have recurring patterns, which was recognized by Vladimir Propp, a Soviet folklorist and scholar. He published his “Morphology of the Folktale” in 1928, more than two decades before Joseph Campbell published his book “The Hero with a Thousand Faces”. Vladimir Propp was born into a Russian-German family in St. Petersburg and grew up speaking both languages (Russian and German). Since childhood, he was interested in different folktales and epics that he heard and decided to study them closer. His main focus became Russian folktales in particular. Propp divides up these stories into 31 narratemes. Not all stories will contain all of these elements, but almost all stories will contain at least some of them. Many of these divisions are similar to what Campbell came up with in his structure (remember that Propp’s structure came two decades before Campbell’s). 1. The initial situation and the identification of a lack of something. 2. Once this lack is identified, the hero has to go on a quest in order to eliminate the lack. 3. During the quest, the hero comes across a magical helper (and a method to solve the initial problem). 4. The hero has to pass several tests and overcome many challenges. 5. The hero succeeds in his quest and returns home victorious. Notice how these elements are common to many different tales that are around us every day, whether in movies, or real life. You can do a little experiment for yourself in order to try to apply this structure in practice. Watch Star Wars and try to identify the different narratemes that these movies contain. Having an understanding of these different elements will give you a new perspective and a deeper insight into different stories that you might come across. These narratemes are not only present in legend and fiction, but also in many of the great stories of our history. You can even use this same structure to help shape your own life. 1) Identify something that you want to achieve and set a goal for yourself. 2) Go on a quest to reach your goal. 3) You come across a mentor or a method to help you. In modern times this can be a person, a book, a website, or a gathering of inspirational people. These can not only serve as mentors, but can also provide you with various methods to solve many of your problems. 4) In order to reach your goal, you will have to pass several tests and go through many obstacles. It won’t be easy. Every good thing in life requires hard work. 5) Finally, you will succeed and reach your goal. Victory will be sweet. Watch, read, listen and learn, then go on to apply the lessons that you learned. Learning about Russian folk epics, will not only make you more interesting when talking to Russian girls, but can also help you become a better, stronger man. You too can live the life of a hero, you just need to identify your goals and start your quest. An earlier version of this post was first published as a guest post here. Also check out the real life story of a troop of Greek warriors who had to trek a long time through enemy territory in order to get home: here.